Newsletter #2, 2011: Last week was brutal, but what can we expect going forward? The S&P 500 was down 7.2 % last week, which was the largest selloff in 32 months! This selloff has in a little over a week wiped out USD 2.0 trillion, almost the same amount as the combined size of QE1 and QE 2. 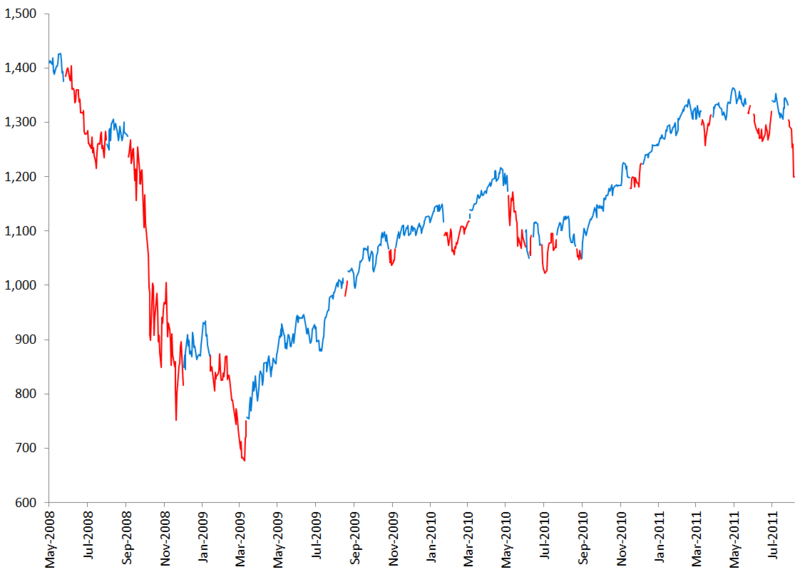 This just shows how fast asset values can deteriorate in a stock market downtrend. In other words this was a big event. I have not sent out a newsletter for many months now, the last one was on March 25th, but I feel that the performance of the market over the last few weeks calls for another one now. Before I get into what I will discuss today I want to remind you to pay close attention to the model I use to calculate the turning points in the market. The model does not perform that well in a choppy market like we have had for most of this year, but in a longer time frame, as the chart below indicates, it has performed pretty OK. Performance of the model since its inception in May 2008. The line is BLUE those days that the model indicates that we are in an UPTREND and RED those days that it indicates that we are in a DOWNTREND. Official numbers say that unemployment is falling, but does that really matter? Is this market correction the start of another bear market? You have not heard from me in a while now and that is because we have been in a continuous uptrend since December 7th last year when I sent out my last newsletter. After more than three months of uptrend the market entered a new DOWNTREND as of the close of Thursday March 11th. I sent out my short notice the next day and this is finally the follow up newsletter. If the US was to see a repetition of 1937/38, maybe Japan could be a good place to put your money right now? Bonds at record low yields, is it time to exit? As always some people view the stock market as extremely cheap, so should you maybe put your money there? Talking about 1929 that was the start of long period if deflation, what is the current status on inflation vs. deflation? Hey, by the way, did I mention that the US will go bankrupt?